Located on the tranquil shores of Discovery Bay, sits this magnificent home away from home-the ultimate in comfort and luxury. Set on its own large private beach cove, Keelawee is an elegant, 8000 square foot, two-story home with six air-conditioned bedrooms and six en-suite baths. The home provides the very best with its combination of privacy and luxury. Interiors are colorfully furnished in tropical colors and art. 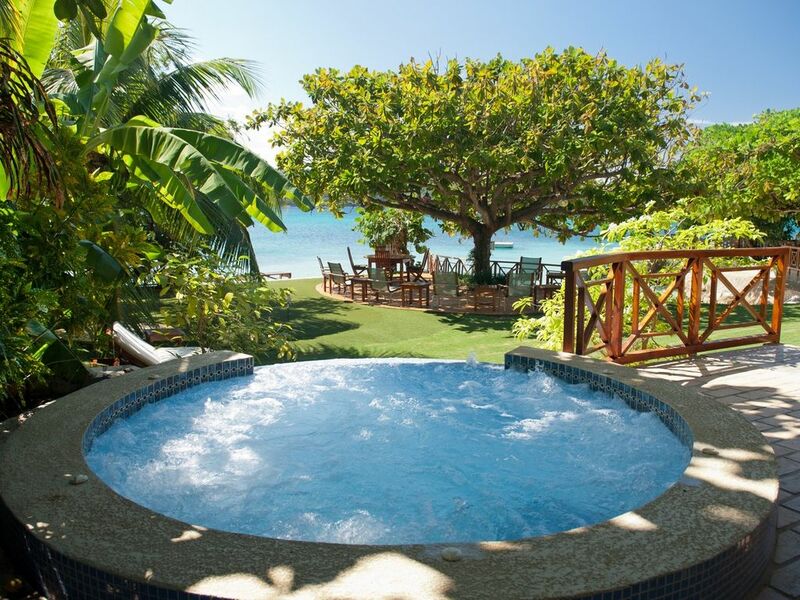 Stepping stones lead 35 feet from the villa across the lawn to Keelawee's private white sand 100' beach cove and the Caribbean Sea. Keelawee is impeccably maintained and has exquisite gardens. Wonderful and colorful trellises draped with flowering vines grace the outside stone of the home. Muted tropical colored washed walls, Dhurrie rugs, colorful chintz fabrics and original art grace the interiors. Keelawee is built on two levels and offers spacious and comfortable living areas. The main level features the interior living area, formal dining room, kitchen and two of the bedrooms. A wooden stairway leads upstairs to a second sitting area furnished with overstuffed sofas, card table, 32' TV, computer and Fax as well as games. Four additional bedrooms and bath suites to include the master bedroom are located on the upper level as well. The home has been recently upgraded and features even more living space and all amenities. An expanded living room opens to a casual verandah and wet bar. Just beyond guests will find the private 16' x 34' swimming pool complete with an Italian tiled circular seating at the deep end. Entertainment options include 8 cable TV's, 2 DVD's, VCR and sound system. Dining options include both formal indoor and casual outdoor dining tables that can easily accommodate 12 guests for exceptional meals prepared by the villa's outstanding cook. As is the case with most beachfront villas on Jamaica, the staff is happy to grill food and put up torch lights for a wonderful beach party experience. Rental of the villa includes complementary sea kayaks and there is a sunning platform in the bay. Additional recreational amenities include a lit laykold tennis court and a 3 hole putting green (both putters and balls are provided). Keelawee has a wonderful air-conditioned well equipped private gym with a TV, DVD player, spinning bikes, a treadmill, multi weights machine and free weights as well. The villa is extremely child friendly with all of it's bedrooms located under one roof with interior hallway access. Additionally, there are 2 complementary cribs and high chairs. Additional perks at the villa include wireless Internet and complementary phone calls to the US VOIP. King-size bed, garden view. En-suite bathroom with tub-shower combination. For large family reunions/groups, the villa may be combined with its sister villa Whispering Waters for an additional 7 bedrooms (combined there are 13 bedrooms, 2 pools, 2 tennis courts, 2 beach coves and two staffs). For even larger groups Keelawee may be combined with other neighboring villas in Discovery Bay such as Fortlands Point, Sugar Bay, A Summer Place, Sundown, Coral Cove 1 &amp; 2, Seagapes and Sea Haven.